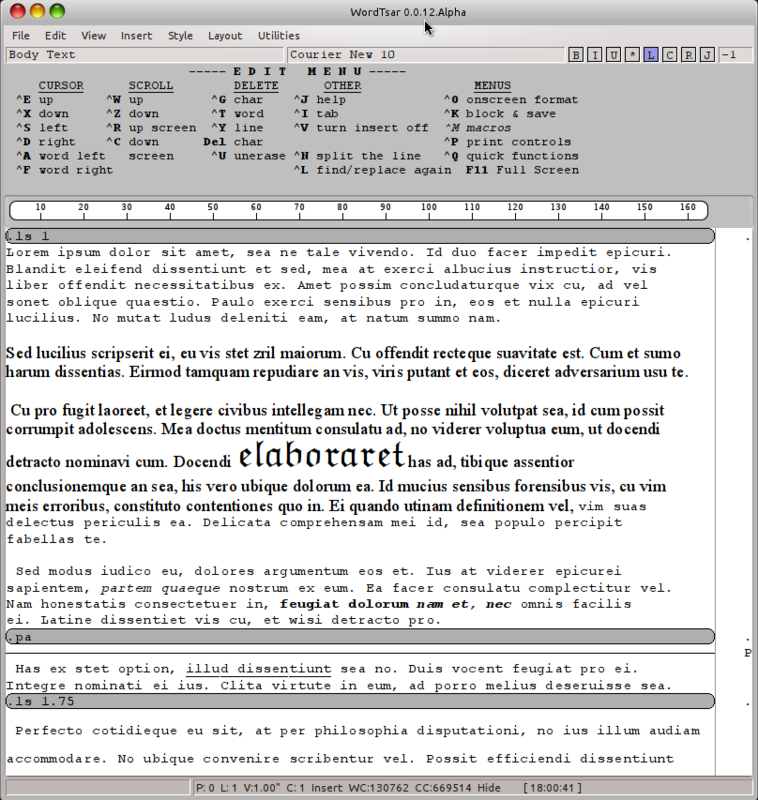 I’ve been getting questions about my WordStar clone (WordTsar). Some people want to know if it’s ready for beta testing yet… when can they get their hands on it. Not yet. Summer is never a great time for me to be coding or writing, and I’ve fallen behind. I did refactor the display engine, and I need to do more work in there. Also, almost none of the dot commands are implemented yet. None of it’s overly difficult, but it is time consuming. The application currently runs on Linux (very good), Windows (so so), OSX (mediocre). Sign me up to test when you’re ready! Wordstar was my first word processor on my first computer (a Kaypro 10). I’d like to try your software. About 1981 or 1982 I worked for a small gov’t contractor. I was writing a whole system for the 6805 CPU (which didn’t have much address space, but still). We had S-100 computers running CPM (Quasar QDP-100s with 8″ floppies). One had an ADM-3A but mine had a sweet TeleVideo 920. But… I was writing all the code in ed! An hour later (had to write the keyboard and video hooks) I was in hog’s heaven. I still have a lot of finger memory for WS even though I gave up the emulation in emacs years ago. I wrote my first couple of books on WS and really griped having to go to MSWord. Great stuff. Of course, I can run real CP/M WS on my Briel Altair clone but it is hard to get it back off to the real world. Very, VERY excited about this project! Modern word processors just don’t cut it, and since I do a lot of writing/revising, I need something smoother and less like a typewriter. Stumbled across your page and my jaw dropped when I saw you were working on a WordStar-alike. Can’t wait to give it a try! I’ve been struggling to find a decent WordStar replacement, but so far everything’s been lacking (currently using Emacs emulating the WordStar bindings along with JOE). The notes feature is by far the most useful tool I’ve used as a writer, and I miss it! Very excited about WordTsar and can’t wait to give it a try.